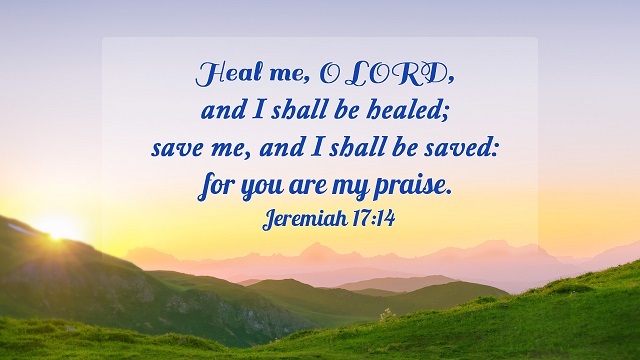 And said, If you will diligently listen to the voice of the LORD your God, and will do that which is right in his sight, and will give ear to his commandments, and keep all his statutes, I will put none of these diseases on you, which I have brought on the Egyptians: for I am the LORD that heals you. And the LORD will take away from you all sickness, and will put none of the evil diseases of Egypt, which you know, on you; but will lay them on all them that hate you. Surely he has borne our griefs, and carried our sorrows: yet we did esteem him stricken, smitten of God, and afflicted. But he was wounded for our transgressions, he was bruised for our iniquities: the chastisement of our peace was on him; and with his stripes we are healed. O LORD my God, I cried to you, and you have healed me. Many are the afflictions of the righteous: but the LORD delivers him out of them all. Cast your burden on the LORD, and he shall sustain you: he shall never suffer the righteous to be moved. Then they cry to the LORD in their trouble, and he saves them out of their distresses. He sent his word, and healed them, and delivered them from their destructions. And Jesus went about all Galilee, teaching in their synagogues, and preaching the gospel of the kingdom, and healing all manner of sickness and all manner of disease among the people. And his fame went throughout all Syria: and they brought to him all sick people that were taken with divers diseases and torments, and those which were possessed with devils, and those which were lunatic, and those that had the palsy; and he healed them. And when Jesus was entered into Capernaum, there came to him a centurion, beseeching him, And saying, Lord, my servant lies at home sick of the palsy, grievously tormented. And Jesus said to him, I will come and heal him. The centurion answered and said, Lord, I am not worthy that you should come under my roof: but speak the word only, and my servant shall be healed. For she said within herself, If I may but touch his garment, I shall be whole. But Jesus turned him about, and when he saw her, he said, Daughter, be of good comfort; your faith has made you whole. And the woman was made whole from that hour. And the people, when they knew it, followed him: and he received them, and spoke to them of the kingdom of God, and healed them that had need of healing. There came also a multitude out of the cities round about to Jerusalem, bringing sick folks, and them which were vexed with unclean spirits: and they were healed every one. Who his own self bore our sins in his own body on the tree, that we, being dead to sins, should live to righteousness: by whose stripes you were healed. 15 Bible Verses about the Almighty | Luke 1:37 For with God nothing shall be impossible. 9 Bible Verses About Peace: Philippians 4:7 And the peace of God, which passes all understanding, shall keep your hearts and minds through Christ Jesus. 20 Bible Verses about the Sovereignty of God: Proverbs 21:1 The king’s heart is in the hand of the LORD, as the rivers of water: he turns it wherever he will. Here are 25 best Bible verses about teaching children for parents. Teach your children with these Bible verses and guide them to know God.